European integration has long been a divisive issue in British politics, leading to differences within and between parties. Voters’ views on this tend to vary by party support but, in recent years at least, this subject has been some way down the list of issues that voters view as most salient. How do voters view the issue at the moment and what effect does this have on party competition? From a party perspective, the rise of the UK Independence Party (UKIP) has served to exacerbate tensions among Conservatives over how far integration should go and whether the UK should remain a member of the European Union (EU). While the Conservative Parliamentary Party has become more Eurosceptic over time, as argued elsewhere, divisions remain between those favouring withdrawal, those wishing to see renegotiation of membership to varying degrees and those simply wanting integration to go no further than the status quo. Michael Fabricant’s leaked paper on dealing with the UKIP threat suggests a high degree of concern among some Conservatives about competition between the two parties especially given Tory divisions on the issue. This may only have been heightened following UKIP’s second place in the Eastleigh by-election. As Rob Ford argues though, any plans for a blue-purple alliance would be ill-advised at least partly due to the diversity of UKIP voters. One way for parties to deal with internal dissent on the EU issue is to pledge a referendum to be held some way off in the future. This helps to shift the conflict out of the parliamentary party and postpones a potentially divisive discussion of the issue. Parties may gain from this if they make the pledge close to a European or general election and if the pledge quells dissent in the party – or at least dampens it until some future point – and wrong-foots opponents. David Cameron’s decision to promise a referendum following an election and a renegotiation of UK membership terms is consistent with this approach. This is not a new tactic though. John Major used it in 1996 when committing to a referendum if the government recommended joining the Euro, as did Labour when pledging a referendum on the Constitutional Treaty shortly before the 2004 European elections and in 1975 with the referendum on the UK remaining in the European Community. Nevertheless, a risk, in Cameron’s case, is riling the small proportion of pro-integration Tories. However, what are the public’s views on this issue? Do they view it as salient? How do attitudes vary by party support and what is the effect on competition between the Conservatives and UKIP? Cameron’s speech on Britain and the EU led to a spate of polling which, alongside longer running surveys, helps to tell us about where the public stand on these issues. 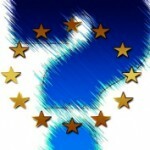 The British Election Study’s Continuous Monitoring Surveys (CMS), which involve monthly cross-sectional surveys of the British public, include a question which asks: ‘Overall, do you strongly approve, approve, disapprove, or strongly disapprove of Britain’s membership in the European Union?’. Combining responses into ‘approve’ and ‘disapprove’ categories, Figure 1 shows trends over time for the groups who have a sense of attachment to each of the three major parties (Con, Lab and Lib Dem). Cameron’s view that the UK’s current terms of EU membership are problematic seems consistent with Conservative identifiers’ higher likelihood of disapproving of EU membership. These levels of disapproval are much higher than those among Labour and Lib Dem identifiers, and this difference is sustained over time. In every survey conducted between June 2005 and December 2012, a majority of Conservative identifiers have expressed disapproval. The average level of disapproval for Conservative identifiers is 66%. Conversely, the average levels of approval for Labour and Lib Dem identifiers are, respectively, 64% and 69%. We can look at the views of party identifiers in more detail by dividing them up according to strength of partisanship (very strong, fairly strong, or not very strong). Table 1 presents levels of disapproval for identifiers of each major party broken down by strength of attachment. 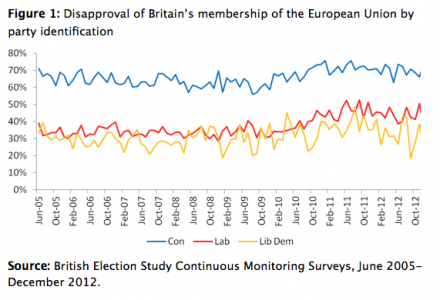 There is a clear pattern here: very strong Conservative identifiers are most likely to disapprove of EU membership, while Labour and Lib Dem identifiers with a very strong sense of attachment are most likely to approve of Britain being part of the EU. Given recent developments on the European issue in domestic politics, we can also chart attitudes on the specific issue of voting in a referendum on Britain’s membership of the EU. Using data compiled from YouGov polls between 2010 and 2013, Figure 2 shows the proportions who would vote to withdraw from the EU, broken down by vote intention. Again, Conservative supporters are much more likely to express a preference for withdrawal, compared to supporters of the other main parties. However, views do fluctuate over time, partly due to differences from one sample to another but also suggesting that, to a degree, public opinion may be malleable on this issue and responsive to developments at the party-political level and resulting media coverage. What are the likely effects of this on party competition? 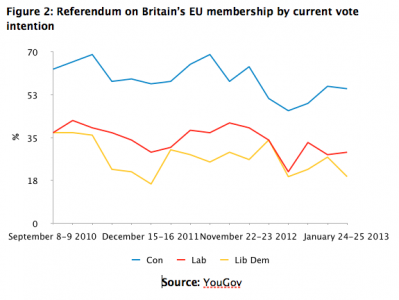 One way of assessing this is to look at how voters view parties’ ability to deal with the EU issue. The Conservatives seemed to come out better than others in most polls taken shortly after Cameron’s speech in January, although not by much of a margin. A Survation poll on 25 January 2013 showed 25% of respondents thought the Conservatives had the best policy on Europe, followed by 19% for Labour and 16% for UKIP. A Populous poll (23-24 January 2013) showed Cameron as the most trusted leader to renegotiate UK membership of the EU with 36% support compared to 18% for Ed Miliband and 10% for Nigel Farage. An Angus Reid survey (24-25 January 2013) showed 22% viewing Cameron as the leader most trusted on Europe, a higher score than for others, with Farage on 11%. Given these polls were taken shortly after Cameron’s speech we would need longer term data to assess how much they represent a temporary boost for Cameron or the Conservatives as the best leader or party at dealing with this issue. We can gain some indication of the effect of the speech on Conservative-UKIP competition via the Survation poll which showed that 42% of 2010 Conservative voters who had heard or read Cameron’s speech, agreed or strongly agreed that it had made them less likely to vote UKIP. Around 21% disagreed or strongly disagreed with this statement. These figures should be treated with some caution as they are based on fairly small numbers of respondents but they indicate the Conservatives may have some basis for concern about the possible leakage of votes to UKIP. Further bad news for Conservatives is that among those who care passionately about the issue, the party appears to have lost out sometime ago. According to the British Election Study’s (BES) post-campaign surveys, at the 2005 general election, of those seeing Britain’s relations with the EU as the most important issue, 35% thought UKIP was the best party to deal with this issue, with 30% favouring the Conservatives. By 2010, of those viewing Europe or the Euro as the most important issue, 61% saw UKIP as the party best able to deal with the issue while only 14% felt this about the Conservatives. While UKIP seem to be in a much stronger position than the Conservatives on this, the problem they face is that the salience of the issue among voters is very low. In the 2010 BES, a tiny 0.7% of Conservative voters identified Europe or the Euro as the most important issue. Data from Ipsos-MORI show that in 2012, only 6% of survey respondents thought that the EU or Europe was most important issue facing Britain. The EU did not even make the top ten issues among respondents questioned in February 2013, despite Cameron’s speech. Analysis of open-ended responses to questions about the most important issue facing the country on the 2010 BES surveys suggests salience may be a little higher than this because some voters explicitly link the EU to other issues such as immigration, particularly from central and eastern Europe, and the economy, often with regard to the financial cost of EU membership. 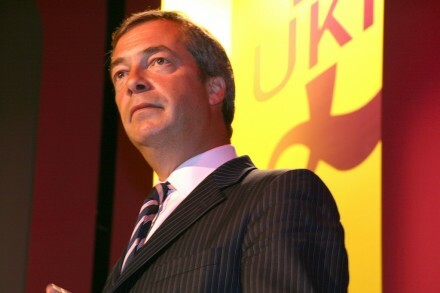 Pointing to connections between EU membership and other issues, such as immigration, is a technique UKIP have used to battle against the low salience of European integration among voters. But raising the profile of this issue is something UKIP will have to do more of if they are to gain clear ownership of this among voters more widely. Otherwise, UKIP will need to continue expanding beyond their core issue if they are to win more votes. Dr Ben Clements is Lecturer in the Department of Politics and International Relations, University of Leicester. His research interests include public opinion on the EU and foreign policy issues, attitudes on environmental issues, and religion in British politics and society. He is currently researching a monograph on the impact of religion on political attitudes and behaviour in Britain (Palgrave Macmillan). Dr Philip Lynch is a Senior Lecturer in the Department of Politics and International Relations, University of Leicester. His current research focuses on the Conservative Party and European integration, party competition between the Conservatives and the UK Independence Party, and Euroscepticism in the UK. His work has been published in British Journal of Politics and International Relations, Parliamentary Affairs, British Politics and the Journal of Elections, Public Opinion and Parties. Dr Richard Whitaker is a Lecturer in European Politics in the Department of Politics and International Relations, University of Leicester. His research interests include the European Parliament and British centre-right parties and European integration. He is the author of The European Parliament’s Committees. The Conservatives: a ‘polite alternative’ to the BNP? I have not seen the Populous poll that found David Cameron most trusted to renegotiate our EU membership, but might there be a problem. Assuming that the question was phrased something like ‘Which party leader do you most trust to renegotiate Britain’s EU membership?’ then there would be a problem for any respondents who do not want a renegotiation. That renegotiation is a ‘good thing’ is implied in the question. Is there data on the proportion of people who think renegotiation is needed? The details of the Populus poll to which we refer are here: http://www.populus.co.uk/uploads/EuropePoll.pdf. You’re right Adam, that the question seems to assume respondents think a renegotiation is necessary. There was a ‘none of the above’ option though, which is not quite the same as disagreeing with the need for renegotiation. 32% of respondents were in this category. 15% of respondents to the Survation poll that we cite said they did not want ‘any more powers’ repatriated (details in Table 10 here http://survation.com/wp-content/uploads/2013/01/EU-Referendum-Poll-Report.pdf).